Though I don't subscribe to the old Southern saying, "If it ain't fried, it ain't food," I do occasionally indulge. But only if it's worth it. And a properly made chicken fried steak is definitely worth it. Also known simply as CFS among those who really love it, it's the ultimate comfort food in certain parts of the country. I don't think it deserves its reputation as a greasy, high-fat food. At least not the way I make it. I use organic grassfed beef, all organic ingredients, and shallow-fry it. The oil needs to be good and hot (or you will end up with greasy steaks! ), but you can't really get a temperature reading on such a shallow depth of oil; just aim for something less than smoking hot. I add back just 3 tablespoons of the pan drippings for 2 cups of gravy. Sounds pretty healthy to me! Of course, my Southern grandmother used Crisco, bacon grease or lard for all her frying. But I like to think she'd be on board with my healthed-up versions of her food. 1 Cut the round steak into 4 pieces. With the textured side of a meat tenderizer (OXO Good Grips Meat Tenderizer), pound each piece (on a meat-only dishwasher-safe cutting board) until almost double in size and about 1/4 inch thick. 2 In shallow dish combine the flour with 1/4 teaspoon each of salt, coarsely ground black pepper and cayenne. In another shallow dish beat together the egg and milk. 3 Working with one piece at a time, season both sides with salt and pepper, dip into the egg mixture, dip into the flour mixture, dip into the egg mixture again, dip into the flour mixture again. Really press the flour in. This really goops up the hands, so just use one hand and keep one hand clean; you'll need it. 4 When all meat is coated, heat oil to a depth of not more than 1/16 to 1/8 inch. You just need enough oil to cover the pan generously. In my All-Clad Stainless 12-Inch Fry Pan, that's 1/2 cup. When the oil is hot, put in two pieces at a time; don't crowd the pan. Cook for about 3 or 4 minutes, or until well browned and crunchy. With tongs, turn steaks and cook second side for about 3 or 4 minutes. 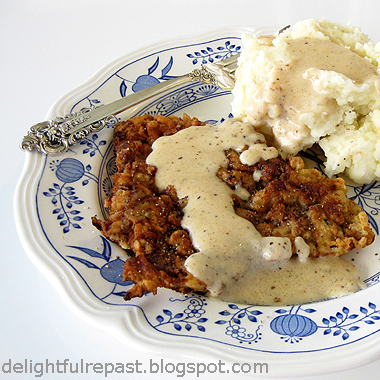 Turn carefully so as not to lose the crust; chicken fried steak is all about the crust. 5 Drain on a paper towel-lined plate (wad up the paper towels; don't just lay them flat on the plate). Repeat. Then proceed to the most important part of chicken fried steak--the cream gravy! Pour off the fat in the skillet, then measure back into the skillet 3 tablespoons of the pan drippings. Use the ingredient list above, but go to my Cream Gravy post for the directions (and a little story about a real pioneer woman, my great grandmother). 6 Plate up the steaks with a generous serving of Mashed Potatoes on the side. Pour the gravy over both. Biscuits and a bowl of collard greens on the side round out this classic Southern meal. This is making my mouth water & my tummy growl! CFS is my all time A#1 favorite food. When done right like you said! And this is done right! Delicious!! Oh I remember the wonderful CFS I ate as a child. My mother's was perfect, heavy on the black pepper, topped with cream gravy. I haven't thought of it in years. I haven't had a CFS in over 20 years. I may need to splurge. Thanks for brings back fond memories. Andrea, thank you so much! I don't eat it often, but whenever I do I wonder why I didn't make it sooner. Thanks, Bonnie. Yep, gotta go heavy on the black pepper. Aren't fond memories wonderful? It seems like all my fondest childhood memories are connected to food! Judy, I'm so excited to think I introduced you to CFS (even though you've made something similar)! Like your plate, it looks so nice on the picture. I too enjoy fried chicken (like my lunch today ;-) from time to time. Gotta try your southern classic some time, hopefully soon. Jean this sounds so tasty. Reading your recipe for gravy surprised me at your use of MILK!!!!!! beef stock, yes. That's what I use. You must realise I am a tentative sort of cook who only knows little bits about cooking so what do I know really??? ha! ha! Once again a great recipe. Add A Little Love, thanks. I come from a long line of English women who just don't feel quite at home without some blue and white dishes in the cupboard! Angie, of course, this is actually beef that is fried in the same way fried chicken is made. I hope you'll get a chance to try it soon. And do let me know how it turns out for you. Tony, yes, milk in gravy would sound strange to you! I'd never put milk in a gravy for roast beef, for example. This gravy (known by various names - cream gravy, milk gravy, white gravy, country gravy) is a Southern (US) thing usually made with fried chicken, CFS or breakfast sausage. Too funny - a lot of people on that planet! I think the reason you don't like so many foods is that you've only ever had bad versions of them. Come back next week for properly made mashed potatoes! Good question, Charles! Perhaps I should have included an explanation for those of you outside the US, or more specifically outside the Southern US. A reader from Wisconsin had never heard of chicken fried steak either. It is simply beef steak that has been prepared and fried in the same way that Southern fried chicken is made. There's no chicken to it! Thank you, Gail! Collard greens are leafy greens related to cabbage and broccoli and look sort of like kale. I'll have to post my recipe soon with a photo. Very popular side dish in the southern US. Thanks, Greg! I love my Southern side. Just had an email from my father's cousin about her mom's (my Southern grandma's younger sister) chicken fried steak. She's looking forward to trying my slightly healthier way of doing it! Your chicken steak looks delicious! I cook a filet mignon steak the other day, but I don't really eat much red meat. Next time, I will be making a chicken steak! I could cry while looking at that photo!!! This looks incredible! It reminds me of eating schnitzel while growing up or having my grandmother's round steak. Her gravy even looks the same. Thanks! Julia, I do not eat great quantities of any meat, or poultry, but when I do I like to eat the good stuff! Kimm, thank you so much! I love it when my food evokes a beautiful memory for someone. All my best childhood memories are food-related and/or grandmother-related. Holy hell, I think southern American cuisine might be my soul food. Haha. Thanks, Hamilton! Well, maybe we'll soon have people calling southern England "New Dixie"!